The Solar System is a dusty place, and it appears there are still secrets hiding among the inner planets. When dust settles in our planetary system, it can form into rings, encircling the Sun, as the material follows the paths of the inner planets. By studying these structures, astronomers may unravel some of the mysteries of the early Solar System. Now, a pair of new discoveries about these structures has just been made — by accident. 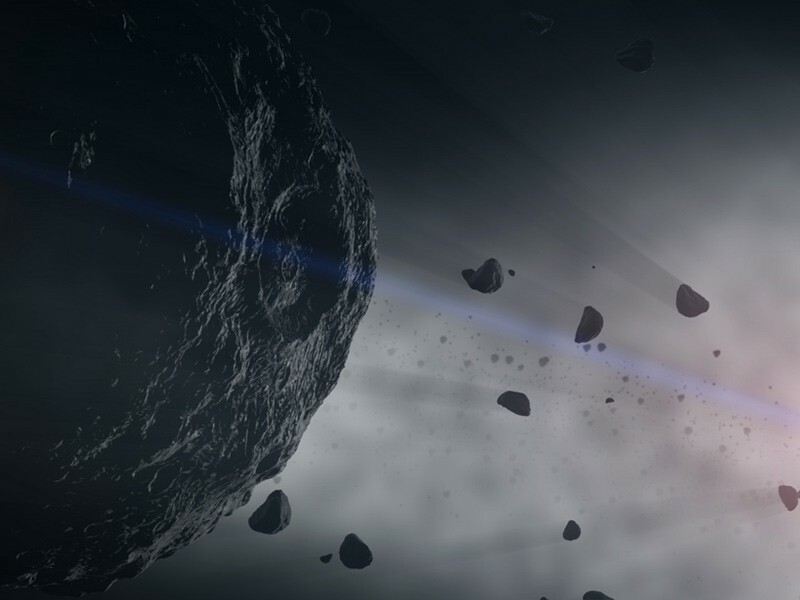 Dust in our Solar System is composed of rubble from asteroid collisions, cometary debris, and the leftover remains of material from the formation of our planetary family. Much of this material is found in rings overlying the orbits of Venus and the Earth. Now, astronomers have found a dust ring following the planet Mercury, as well as evidence of a previously-unknown collection of asteroids in the dust belt following Venus. “We’re not really dust people, The dust close to the Sun just shows up in our observations, and generally, we have thrown it away,” said Russell Howard, a solar scientist at the Naval Research Laboratory. Astronomers were, ironically, looking for a dust-free area of the inner solar system when they came across these new discoveries. 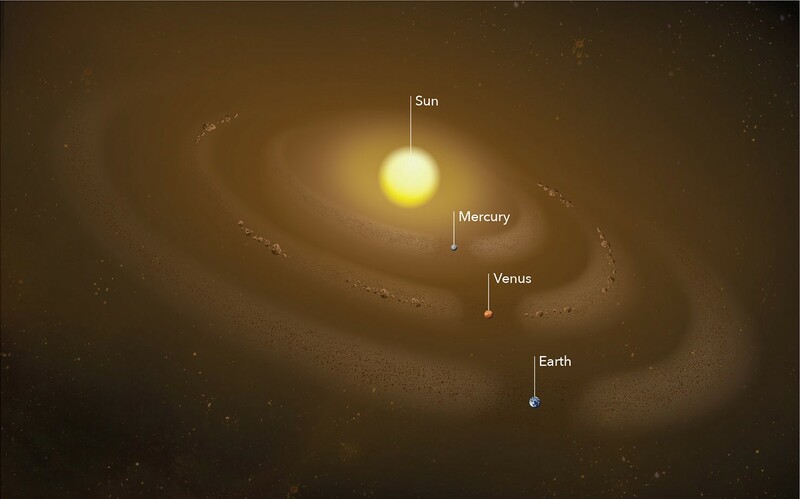 Theories of the formation of our planetary system suggest that areas close to the Sun should be largely free of dust, as material in that region would have, long ago, been pushed away by solar pressure. However, studying these structures from Earth is challenging, since observations are drowned out by the ring of dust surrounding our own planet. This makes it appear that the space in the inner Solar System is dustier than it is in reality. In an effort to get around this problem, researchers utilized images of interplanetary space obtained by the Solar and Terrestrial Relations Observatory (STEREO) satellite. This observatory sees light from the corona (atmosphere) of the Sun, as well as reflected light from dust. However, the light from the dust is 100 times brighter than the that seen from the corona. The astronomers hoped to utilize this data to prepare models for future data from the Parker Solar Probe, currently circling around the Sun, settling into an orbit more suitable for observations of our parent star. Their thought was that if they could find a way of identifying dust in their data, they could eliminate it, proving a distraction-free way of studying the corona of the Sun. In addition, if they found a region where all the light came from just the corona, than they would have found the hypothesized dust-free zone in the inner Solar System. However, what they found was unexpected — a trail of dust trailing the planet Mercury. This marks the first time astronomers have ever studied the region of the Solar System this close to the Sun first-hand. The Parker Solar Probe has already come closer to the Sun than any previous spacecraft, and will come even closer as it continues its revolutionary mission. Mercury, just over 4,800 kilometers (3,000 miles) wide, is dwarfed by the dust trail in which it orbits, which researchers believe measures 15 million kilometers (9.3 million miles) across. “It wasn’t an isolated thing. All around the Sun, regardless of the spacecraft’s position, we could see the same five percent increase in dust brightness, or density. That said something was there, and it’s something that extends all around the Sun,” Howard said. Until this finding was released, astronomers believed Mercury was too small and close to the Sun to have a ring of dust accompanying that world. But, that was not the only unexpected find astronomers recently encountered. The dust ring accompanying Earth was discovered 25 years ago, and Venus was found to have a similar structure in 2007 (a discovery later confirmed by data from the STEREO spacecraft in 2013). Researchers found the dust ring at Earth’s orbit was the result of collisions between bodies in the asteroid belt between Mars and Jupiter. However, computer models showed a ring of dust around Venus formed by this method would not match observations. The only possible way to form a structure like this, they found, would be if Venus was accompanied by a previously-unknown collection of asteroids. This visualization from NASA shows how a group of asteroids accompanying Venus could form a ring of dust following the planet in its path around the Sun. The dust surrounding the orbit of Venus is thin — just 10 percent denser than the concentration of dust in surrounding space, and the largest pieces are just about the size of a grain of material from course sandpaper. However, the structure is massive, measuring nearly 26 million kilometers (16 million miles) high and almost 10 million kilometers (6 million miles) wide. If collected together into one body, this material would make an asteroid over three kilometers (two miles) in diameter. Dust rings have been seen surrounding other stars, providing astronomers opportunities to study the formation of solar systems. These new findings could be used to better understand observations in neighboring star systems. The next step, closer to home, is to see if a collection of asteroids can actually be found following Venus in its path around the Sun, confirming computer models.